In discussing 2004, I said that it was the Amnesiac to 2003's Kid A, not much had changed, and the stuff that was new had become commonplace, and I said that 2005 would not be another Amnesiac. But, so far it has been and it hasn't been. I think I've been much happier so far than last year, but things haven't really changed, maybe I just better learned to focus on what was good. I guess the thing that made me happiest this year was that I actually made a movie, albeit one that still hasn't been edited, but filming's always been the holdup, and Jordan and I wrote something and filmed it. When I get home I'm going to edit it, or at least see that it gets edited somehow, hopefully in time for the LMC contest. I think more than being a great movie, this movie was important because it really taught me about the limits of what we can and cannot do, first limit, don't try to film 60 pages of script in 10 days, but also other more subtle things that have guided me in trying to create new stories. And, perhaps most importantly, I had a lot of fun filming the movie. This was the first time I ever really enjoyed the actual process of filming, and even though there were still the usual headaches, it was much more fun than I had filming stuff before. Maybe that was partially because I was more in control. It's frustrating to be filming a project and not be able to do what you want. Sometimes in the long run it makes a better film, Tabula Rasa was great, and that was a completely group effort, but there were times when I wish I could have shot it more my way. But, on Ricky Frost, I tried to assert myself more, and was just pushed in the leadership position, so I did my best to run with it. Anyway, that was good, but it was January. What have I done since? More of the same really, going to class, I had some really good classes this semester. Youth Culture was by far my best non-film class that I've taken here and Action Film was one of the best film ones. I guess part of what I liked about Youth Culture was that it was all new stuff. Last semester I took US History, and it was a decent class, but I'd done it before. This might not seem as important in the overall scheme of things, but it was new to me and that was exciting. And I'm actually enjoying doing my school work more than I ever have. Writing the paper on Batman Returns was a lot of fun, and it's something I'm proud of. Similarly, the paper I'm doing on how the stress on college admissions is changing high school has been fun to research and lets me revisit some issues from the past. I feel like I'm much less stressed than other people here. Working in the computer lab, I see people pulling all nighters, all dayers, working ridiculous amounts, and not having much fun. I feel like for some people, the stress is as much a part of the work as the actual working is. It's not really work unless you go around telling twelve people how much work you have, when worrying about the work is pointless. You still have to do it either way and whining about it won't make it go away (in most cases, but even if it does make it go away, you'll have put so much effort in whining, you could have been finished with the original assignment by then). But this isn't to say that it's all good. Things are going along, and while I am happy, I feel like there's so much more I could be doing. All my time is occupied, but could it be occupied in a better way? There are things I'm missing out on because I always go with the shelter of what is the same, what is safe, rather than risking something new that could potentially turn out bad, but at the same time could work out incredibly well. And Wednesday I'm done with school and home for the summer. This is the chance to either do that something new, or go back into old patterns. I know what I should do, but can I muster up the courage to actually do it? Hopefully. Either way, at least I've got a job waiting for me, running the LMC camp again. It was actually a lot of fun last year, and I made a lot of money, which is really all you can ask for in a job, especially one that's actually in my industry. I feel like I've learned a lot about film I can convey to these kids, and my ego loved being placed in a position of authority. So, the year is still up in the air. It's had a good start, but needs a little more to make it to a good finish. We'll see where things go. Classes are over for this semester, I've got a few papers to do then I'll be out next Wednesday. It was a good semester, it may sound frivolous to take a course like The Action Film, but I really learned a lot. That course was interesting in the way it used things you wouldn't usually analyze to construct an image of American popular culture throughout the twentieth century. My other classes were pretty good too, probably the best semester yet. Anyway, I recently rewatched Wong Kar-Wai's film Happy Together. He made Happy Together after Fallen Angels, and this film is an extension of the visual style he was already developing there. The film is about a couple of gay guys from Hong Kong who go to Buenos Aires, and drift apart and together over the course of the film. This is a film that's at times difficult to watch, because of the relationship between the characters played by Leslie Cheung and Tony Leung. I have trouble Leslie constantly take advantage of him, and yet they always get back together. What the film becomes about is the process of Tony asserting his independence and getting the courage to leave Leslie. I love the parts with Chang Chen. His friendship with Tony is great fun to watch, and this is the only time in Buenos Aires that the character is genuinely happy, excluding the scene where he cries into the tape recorder, which isn't happy, but is still an incredible scene. Another great scene is later in the film where Chang is at the lighthouse talking about his memories. This film has some of WKW's best voiceover. Most of Wong Kar-Wai's films take place in a glamourous world, where even though people are emotionally upset, they're always remarkably well dressed and move through beautiful environments. Here, everybody seems poor and the main characters' apartment is small and cramped. It's still a gorgeously shot film, but the environments aren't as cool looking as in Fallen Angels or 2046. This is a really adventurous film, the ultimate exploration of the visual style first seen in Chungking. A lot of the film is in black and white, and the color all seems to be treated in some way to draw out certain visual elements, most notably in the soccer scenes and the scenes with the falls. My favorite shot is early in the film. We start on Tony and seem to dollying away from him, then the camera pulls back and we see we're in the car with Leslie, driving away. Really simple, but it works so well. I also really like the vivid red liquids throughout the film, in the Chinese restaurant and the slaughter house. The film visually is amazing, really experimental, but it's tough to find the same amount of beauty in the shots as in Fallen Angels because Buenos Aires just isn't as cool looking as Hong Kong. The whole film really is about the longing for home, for Hong Kong. Tony Leung only has one reason to be in Buenos Aires, and that's Leslie, so once they break up, and Chang Chen leaves as well, he feels this ennui and a strong desire to get back home. The last chunk of the film has an impatience about it. He's working in the slaughterhouse to get enough money to go back , and it really feels like you're making this journey with him. What's remarkable about the film is that when he does make it back at the end, you feel the same sense of being home that he does. I've never been to Hong Kong, and I'm sure it would be an absoultely alien world, but in the film, it feels so comfortable and welcoming, and in the absoultely phenomenal final scene, where Tony rides the train around the city at night, with the title song playing, there's such a feeling of peace, after a lot of trauma. Why is this? I think it's partially because of my knowledge of WKW's other films. It feels odd for his characters to be in Buenos Aires, so when they get back to the site of his other films, it's comforting, that's a part of where the feeling of home comes from. I think it's also from Tony Leung's acting, he always seemed pained when he's in Buenos Aires, but when he makes it back, he seems happy for the first time in the film. Also, I think a lot of the feeling of the people making the film went in to the film itself. I know WKW originally intended to end the film with Tony dying, but instead chose to give him the happy ending of making it back to Hong Kong. It was a long shoot and I think the crew's longing to return home becomes a part of the film. In that afforementioned last chunk you can really feel this. This film is part of what I would consider a loose stylistic trilogy with Chungking and Fallen Angels. It's interesting that they all end with the same feeling, the sense that happiness won't last forever, but if we can just find happiness in small moments, that's enough. So, the endings aren't exactly ecstatic, but they're upbeat, and you get the sense things are getting better. This is a stark contrast to his 60s trilogy, which ends with emotional ties broken and characters distraught. One of the reasons I like it when WKW makes films in the present is because of the choices he can make musically. Happy Together has one of his best soundtracks, notably the Frank Zappa songs. The music really helps make the visuals more stylish. 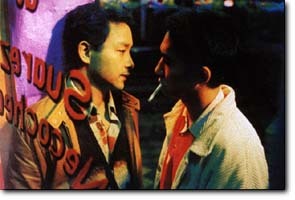 So, the only thing that really hurts the film is my mind is Leslie Cheung, who plays characters that really bother me. This character is a throwback to Yuddy in Days of Being Wild. I guess what annoys me most about his characters is the fact that people are drawn to him even though he's such a mean guy. This may be bringing out my own issues, like, why are women always attracted to these charismatic, but shallow and nasty guys, instead of people who are actually nice and really care about stuff. But, you're not viewing the film in a vacuum, it's all about the personal emotional connection, and what you bring to a film has a large impact on what you get from the film. So, my distaste for people like Leslie may result in a skewed view of his relationship with Tony. But, I feel like I can take an objective enough point of view to recognize that while Leslie may have some redeeming characteristics, the work is ultimately about Tony liberating himself from this emotionally manipulative person, and expressing himself as an individual. I think Happy Together is an incredible piece of work. It's at once different from everything that WKW has done, and at the same time, contains everything that makes his films great. The stylistic experimentation is his boldest to date, and it's full of really affecting emotional moments. This is the film that really put him on the world map, critically speaking, and with good reason. Watching this is watching the medium used to its full potential in the service of storytelling and visual artistry. 5. Buffy the Vampire Slayer - I don't think any work had a hold on me for such a long time as Buffy did. 144 episodes, plus 112 for Angel, just the sheer time I put in watching the show means it would have a big impact on me, but add to that the fact that this was such an amazing story and you've got something that really changed the way I look at storytelling. I think that Buffy did that no other work I've encountered has done is allow you to watch characters grow and change over a really long period. It's amazing to compare Willow from season one to Willow from season six because there's so much change, but at the core, it's still the same person, and I feel like that's what real life is like. So, Buffy had these massive character arcs, which proceeded along over seven years. It's just such a big story, following seven years in these peoples' lives. Also, Buffy has made me much more open to relationship driven storytelling. This was a work where the plot was always secondary, it was primarily about the characters, and that's changed the way I would approach stories. In what I'd consider the best season, season six, there's not much outside plot, all the conflict comes organically out of the interaction between the characters. Seeing that sort of story opened me up to stuff like Six Feet Under, which is quite similar to Buffy, only without the vampires. This is the work that solidified for me the potential of telvision as a completely unique storytelling medium. 4. Twin Peaks - I wasn't sure whether to put Twin Peaks or Buffy higher up on this list, but I chose Twin Peaks, because it was Twin Peaks that led me to watch Buffy, it was the first TV series that really addicted me, and led me not only on to many other TV shows, it also led to me to all of David Lynch's other films. I think what Twin Peaks does that is so unique is create an atmosphere that makes the series like a place you can go to, rather than a bunch of people that you watch. So, the show really is about the town, not about the specific characters. Watching this show was such a strange experience, it's still the most bizarre TV series ever made, I remember watching the red room sequence for the first time, it was perhaps the most stupifying thing I'd ever seen, and still is, with the possible exception of the series finale, which left sitting there stunned for literally five minutes without moving, wishing that I could have just a little more. It was actually Mulholland Drive that led me to watch the show, but TP really solidified my interest in David Lynch's work, and led me to check out all his other films, he's perhaps the most influential director for me in terms of the films I'd want to make. The surrealism, most notably in TP, was unlike anything I'd ever seen before, and I'd love to make stuff that otherworldly. Watching Lynch makes every other dream sequence or fantasy scene just seem pathetic, with the exception of Buffy's Restless. In Fire Walk With Me, Lynch makes a film that is incredibly surreal, constantly making you question what's going on, and yet keeps an emotional throughline, so that even if you don't know what is going on, you can feel what the characters are feeling, and I'd love to make a film that does the same thing. 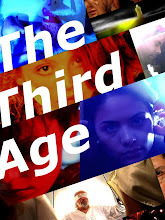 What this series also did was raise the bar on what I thought television was capable of. I'd never seen something with this level of serialization, or with lingering consequences like this. It was so refreshing, and sent me off to look for other series that would replicate the experiences. If I hadn't seen Twin Peaks, I probably would not have seen Buffy. Anyway, I guess most importantly, the show really made me think of what qualifies as strange in new ways, and the wordless storytelling in 2.7 or the last episode made a huge impact. 3. Watchmen - Before I read Watchmen, I was a casual comics fan, reading the occasional X-Men book. After reading Watchmen I was hooked for life. The book completely changed what I thought was possible with the medium of comics, it was the first comic book I read that I would consider art, and the way it used the medium was awe inspiring. This was also one of the first works that I really analyzed deeply on my own. Rereading the book, I discovered so many layers, and was just astounded by the world that Alan Moore had created. Part of what was so striking was the sense of discovery, I just picked up this book after hearing about it online and was stunned to find such an amazing work of art. I read a lot on the book after going through it, and it sent me out in search of a comic that would match it. In this search, I read a ton of great stuff, and eventually did find a comic to top Watchmen. Part of the appeal for Watchmen, much like I talked about with Twin Peaks or Magnolia, is the way that it blends this perfect construction with incredibly emotional stuff. The Jon on Mars chapter is a really intricate view of 4D time, but it's also a really sad story of a man drifiting away from humanity. Very few things have hit me as hard as the end of this book, particularly the series of panels at the end of Chapter 11 and the opening of 12. So, this book made me want to make comics, and really changed what I thought was possible with the medium. I've thought about this book more than almost anything else I've read. 2. The Invisibles - After reading Watchmen, I went on a long quest to find a comic that would match it. I read some great books, but nothing that was on the level of Watchmen. Then in May 2002, I picked up the first volume of The Invisibles. This was a book I'd heard about because it was supposedly the basis for The Matrix, and I'd heard all kinds of things about it, like you didn't have to read it in order, etc. So, I pick up the first book, and I remember thinking, this was better than The Matrix, then I picked up the second book. I remember reading 'Best Man Fall,' and being shocked because I had had the exact same idea for a story, but Morrison did it so well mine was rendered irrelevant. Then, I got Entropy in the UK, and on the first page of the book, it just clicked. The whole book came together in one page, it was Gideon Stargrave driving a boat, blowing stuff up, and the sun looking like Barbelith, with a Pink Floyd quote below it. It was all there, the big ideas, the pop, the cool, and from then on, the series became an obsession for me. I read through Kissing Mister Quimper, and then had to wait three months for the last trade to be released. So, I decided to reread it, and it was there that the series basically took over my thought process. I had an epiphany on almost every page, and by the time I reached Kissing Mister Quimper again, I was just in awe of what Morrison had done, and felt like I got it, I understood the book. Then, I read the last volume, all 12 issues in one day, the last six in one sitting, and I realized I didn't know anything, but there was something amazing there. Barely coherent, reading that last issue, Robin emerging from the timestream and hugging King Mob overwhelmed me. After that, I went onto the Barbelith message boards, and read everything I could about the book. At the same time, I started loaning out comics to my friends, and I gave some of them The Invisibles, and as they read them, we began to talk about the ideas in the series, so that for months after finishing the series, I was still processing it and discovering new layers. While reading the books was a massive thing, it was really these discussions afterward that made it so valuable. The Invisibles was a gateway that opened me up to all kinds of new ideas about time, the universe, everything. An entire worldview is contained in the series. But, the thing that made the series so important to me is that it's not just this dry instructional text, it's so incredibly pop. The Invisibles really created this concept of pop! for me, and it's guided me as I've gone along, uniting many of the works that I love the most. I think a lot of the reason I love Wong Kar-Wai so much is because he taps in to this same sort of pop as Morrison does. Morrison's work is so cool, every single moment is fun to read. So, it effects you both on the surface and very deeply. I think The Invisibles is the greatest work of fiction ever, and it exerts a huge influence on everything I create. 1. Star Wars Trilogy - Even though The Invisibles is so great, there is still one work that has exerted an even greater pull on my life, and that is the Star Wars trilogy. I can't even remember a time when I hadn't seen Star Wars, it's so ingrained in to me, they've always been there. It's like, you know you shouldn't eat grass, but can you remember a specific moment where you found out it's a bad idea, I just know these films. Star Wars has always been with me, I saw it when I was very young, and it was there that my love of film and science fiction began. Even at that very young age, I never wanted to be Luke Skywalker or Han Solo, rather I wanted to tell stories with people like Luke and Han. Star Wars was the first film I loved, and Empire is still my favorite film of all time. Sometimes I'll think there's got to be a better film than Empire, but then I watch it, and it does everything I love about cinema. The visuals are amazing, the score phenomenal, the characters really well developed, and you can't help but get caught up in the story. I've seen the film at least 50 times, and still, every time I see the lightsaber duel, the pure emotion of it is dazzling. I may not want to make something exactly like Star Wars, but I hope to one day make films that build a world like Star Wars does, to take you away from everyday life and give you a glimpse of something fantastic. If I hadn't seen Star Wars when I was young, it might not have hit me as hard, and I might not have gotten the desire to make films. So, I guess that's why it's the most influential work on me, it's always been there and it always will be. There's something so perfect about the fact that the Star Wars saga ends on the same day that I turn 20, because more than anything else that I've encountered, Star Wars has really shaped me. It's been some good times watching movies and TV and reading comics. Looking at this list, it seems that the things that affect me most are those that blend some supernatural or sci-fi elements with well developed characters, and high emotional content. These are the works that make the world seem extraordinary in some way, and show that there is magic beneath that which seems ordinary. "Our Sentence is Up: Seeing Grant Morrison's The Invisibles"